INDIANAPOLIS — A growing number of individuals of all ages are surviving intensive care unit hospitalization, however their mental and physical health problems persist. A new study from Regenstrief Institute and Indiana University researchers reports that a care model they originally developed for older adults with dementia could benefit ICU survivors of all ages. The 51 ICU survivors in the new study were the initial patients seen in the first CCRC — the Eskenazi Health Critical Care Recovery Center. They ranged in age from 40 to 70 with an average age of 55. Prior to the trauma or illness that had brought them to the ICU, nearly all were psychiatrically normal and functionally independent. During their ICU stay more than three-quarters of the study participants had required mechanical ventilation and almost half were given antipsychotic medications for delirium. Following ICU discharge 88 percent had cognitive impairment and 60 percent experienced depression, recognized upon their subsequent follow-up as outpatients in the CCRC. “Critical Care Recovery Center (CCRC): Can a Geriatric Model of Care Guide Recovery of ICU Survivors?” is published in Fall 2017 issue of the peer reviewed journal Best Practices in Mental Health. According to Dr. Wang, the problems encountered after ICU discharge, known as Post Intensive Care Syndrome or PICS, should be viewed as a multifaceted disorder of cognitive, psychiatric, and physical impairment. Because the CCRC model is equipped to handle those complexities, it is a good fit for the ICU survivor population, regardless of the individual’s age. About 5 million adults are admitted to medical or surgical ICUs across the United States every year. 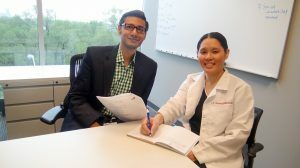 “The CCRC is an interdisciplinary model of care focusing on the unique needs of ICU survivors, a growing population that does not receive specialized care it deserves,” said study senior author Babar A. Khan, MD, of the Indiana University Center for Aging Research, Regenstrief Institute, Center for Health Innovation and Implementation Science and IU School of Medicine.”Our local example demonstrates how a healthcare system can be leveraged to develop and sustain a new model of care. “The CCRC model can be modified and adapted at different healthcare systems depending on their individual culture so that ICU survivors receive the care they need and deserve. Doing so may help in reducing the societal, financial, and economic burden posed by the post-intensive care syndrome.” Dr. Khan is an intensive care physician who developed the CCRC model and the medical director of the Eskenazi Health Critical Care Recovery Center. The study was supported in part by National Institute on Aging grants K23-AG043476 and R01AG034205. Authors in addition to Drs. Wang and Khan are Sue Lasiter, PhD, RN, formerly with the IU School of Nursing and now with the University of Missouri-Kansas City School of Nursing and Health Studies; Ben Zarzaur, MD, MPH, IU School of Medicine; Tiffany Campbell, BS, Indiana Clinical and Translational Sciences Institute; and Malaz Boustani, MD, MPH, IU Center for Aging Research, Regenstrief Institute; Sandra Eskenazi Center for Brain Care Innovation, IU Center for Health Innovation and Implementation Science and IU School of Medicine.